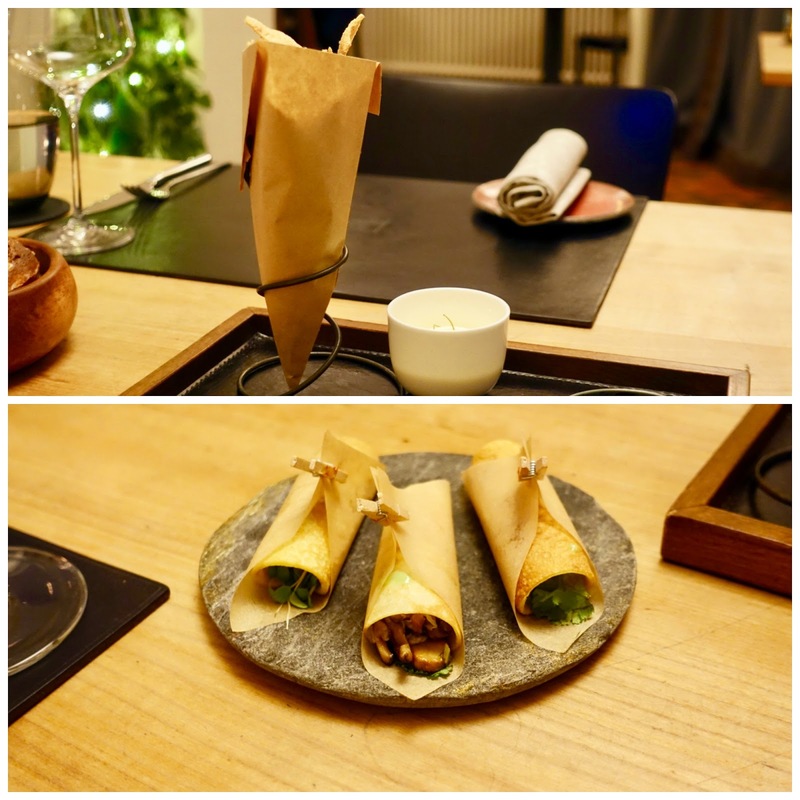 Yet another visit to one of Zurich’s elite chefs was undertaken by my family comprised of my husband, our adult son and myself, together with other extended family members. This time, it went to Langstrasse, Zurich’s nightlife hotspot. Here, Fabian Fuchs, one of the “young wild chefs” have been at work since 2012 at the former neighborhood restaurant of Sankt Meinrad, now under the name of EquiTable. the city’s nightlife center. Once the red-light district, this neighborhood is now a hub of international restaurants, bars and varied shopping. While the area have been upgraded in the recent past and it is popular with party goers, it is – at least in my view – still a bit grubby in certain spots, but not at the location of Restaurant EquiTable, which seems to be quite okay although not the typical setting for such a classy restaurant. 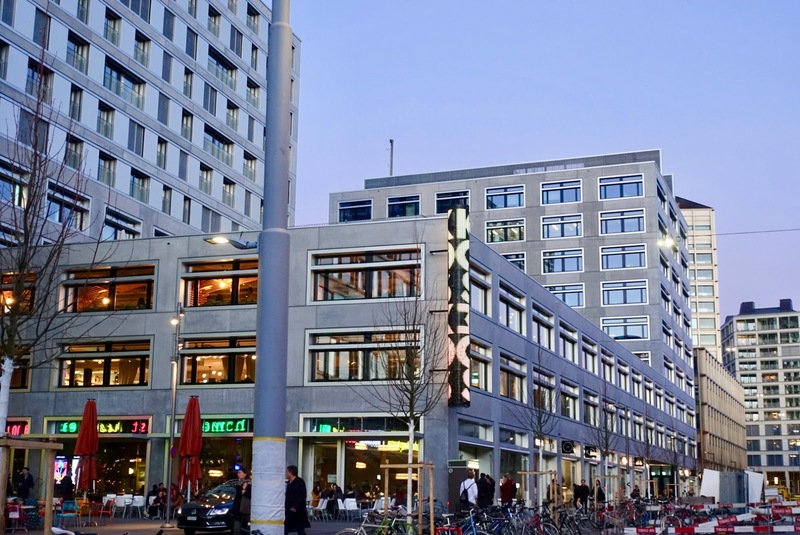 When traveling by public transport, it can be relatively easily reached from Zurich’s main railway station either by foot (twenty minutes), or by bus/tram in about ten minutes. had been through some turbulent times before Restaurant EquiTable was brought to life in 2012. A club comprised of 250 small shareholders established an eatery where faire trade food in combination with seasonal, regional and whenever possible organic produce is used. The restaurant is not large, the kitchen even more so, there is only room for two chefs. While some elements of the old tavern character were preserved (wooden paneling, tile floor and entrance area), other parts underwent a facelift with contemporary tables, chairs and hanging lamps. 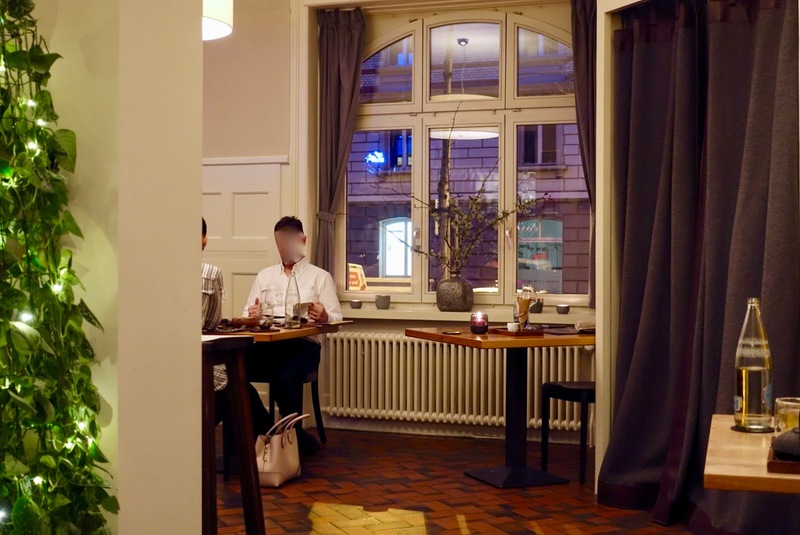 A casual fine dining approach with bare wooden tables with leather placemats is featured. The ambiance in here is casual, guests are indeed meant to have a good time. After a friendly welcome we were ushered to a large table in a quiet corner. It did not take long until homemade chips, butter, duck liver pate and house bread were brought to our table, even before we were informed about the proceedings in this place. 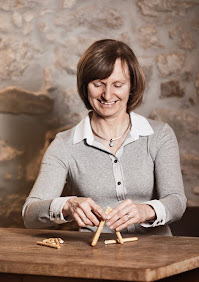 When the tasty bread, made in-house, was finished in no time – the recipe can be found on the homepage, by the way –, we were asked whether we cared for more, and of course we did! Ever since that moment, the supply never ran out! The service team under the lead of Julia Besel had everything under control at all times. The servers were cordial, attentive and informative. I only wished that all of them would speak up, so that you could properly understand what you are going to eat (surprise menu, see food concept). But that was the only (minor) issue we had. As already mentioned, sustainability is the key here. Whenever possible, seasonal fair-trade products are used here stemming from local producers at best. You are in on for a surprise menu when dining at EquiTable, you can choose the number of courses ranging from four to eight ones and indicate in case you want eat vegetarian, that is it! 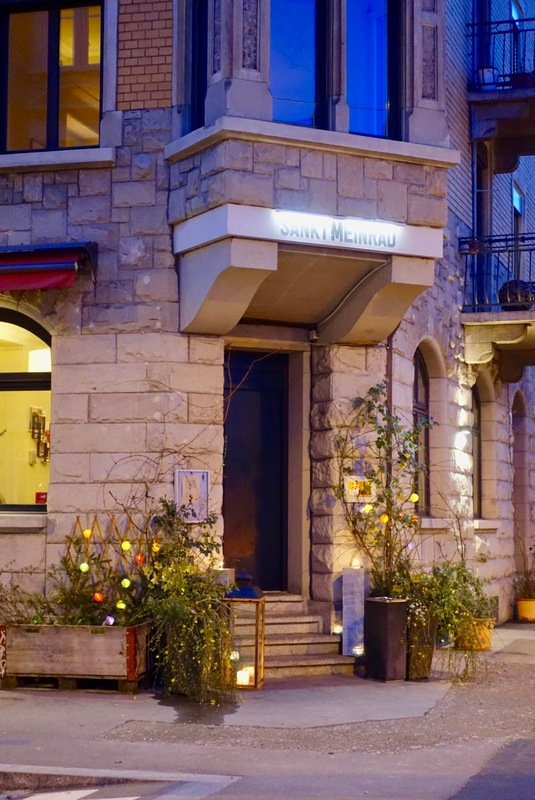 If you are curious – as I am –, you can google what is on offer by entering “equitable zurich menu” into the browser window and you get to a page “Menu – EquiTable” where you can click on a non-vegetarian menu (omnivore) and a vegetarian one (herbivore). You also receive this link on a small card at the restaurant when settling the check at the end of your meal. As indicated, the chef here, Fabian Fuchs, is one of the “wild young chefs”, with long hair and tattoos. 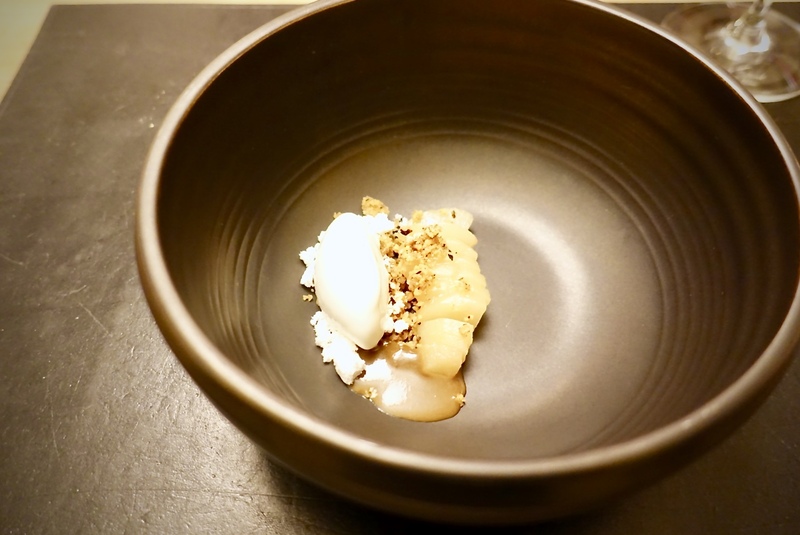 His career stations include working with Nenad Mlinarevic at Restaurant Focus at Lake Lucerne and with Marcus Lindner at Restaurant Mesa in Zurich (see here my review, with the current chef), both hotshots in the Swiss gastronomy. When it comes to the style of cuisine, the chef follows a more purist, reduced approach of haute cuisine. Instead of a myriad of components he focuses on a few and orchestrate them in a clever way so that the dishes burst with flavor. He was awarded 17 Gault Millau Points (one more than last year) and a Michelin Star (since 2015). 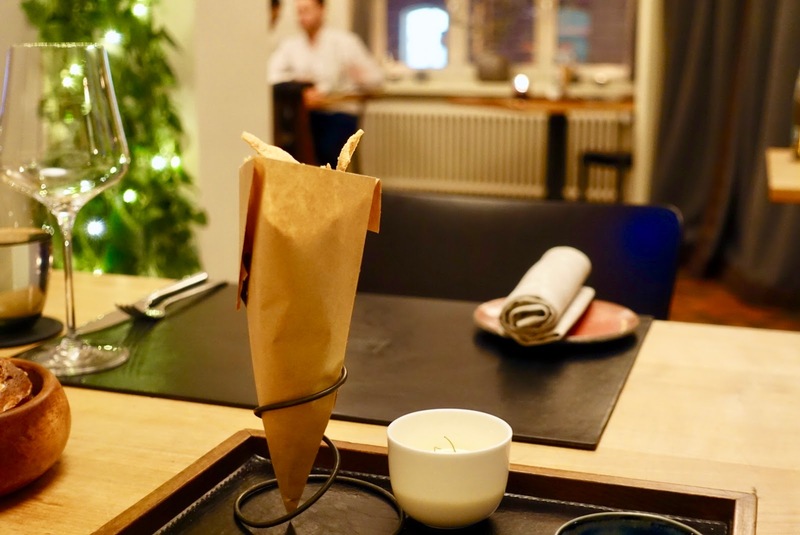 In terms of pricing, dining here comes with quite a high price tag, however there is nothing wrong with this considering the quality provided and the fact that the dining experience is indeed a memorable one. Four courses cost 125 SFR, five 145 SFR, six 165 SFR, seven 180 SFR and the whole shebang (eight courses) amounts to 190 SFR. A wine pairing is also available. The dinner began – as already outlined – with chips, bread, butter, duck liver pate and two other snacks (whitefish with buckwheat groats paired with a beetroot essence and an omelet filled with herbs, mushrooms, savoy and tomato), a promising start that makes you curious about what follows. The first course – one of my favorites – was sublime salmon from the Swiss Alps, reared indoor in fresh mountain water, combined with Chinese cabbage, dill and radish. Another fish dish was next, confit pikeperch from southern Switzerland with onion stock, parsley and carrots. 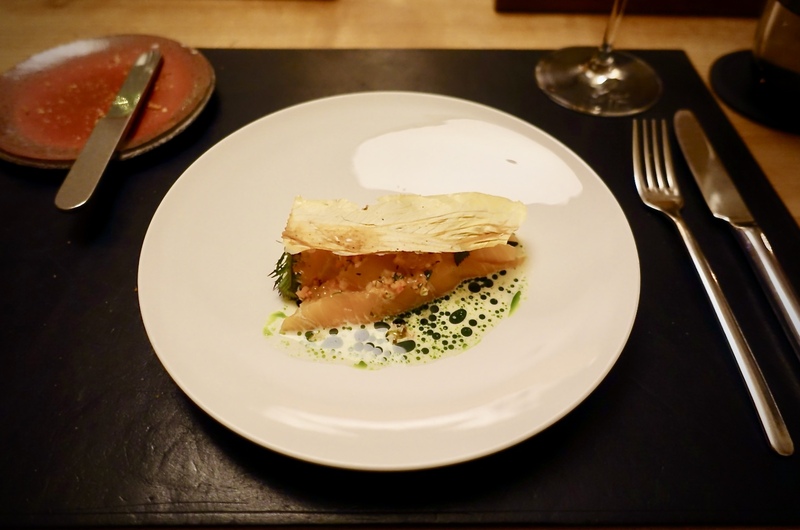 We proceeded with a vegetarian course – another highlight of mine – blue mountain potatoes from the Swiss Alps with an unbelievably intense flavor married with baked apple, watercress and garlic. The first meat course came as a bit of a surprise. 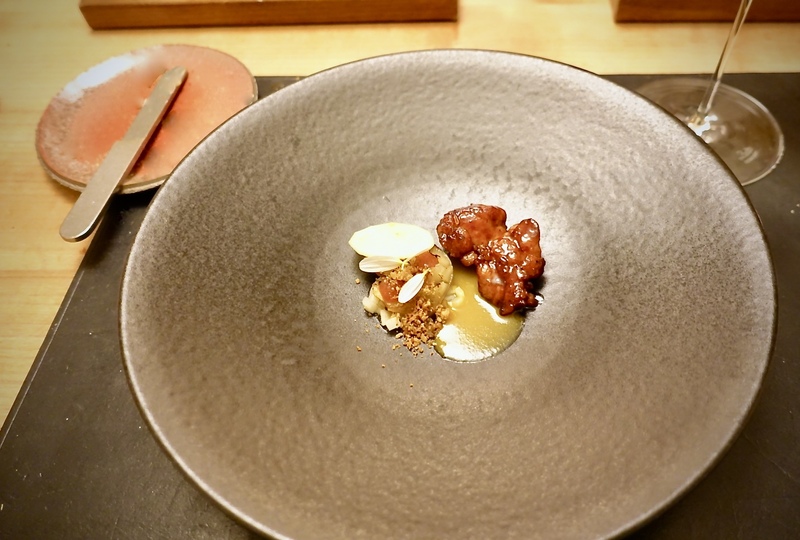 It was veal, but in the form of offals, crispy baked sweetbread paired with cabbage, Jerusalem artichoke and herbs. 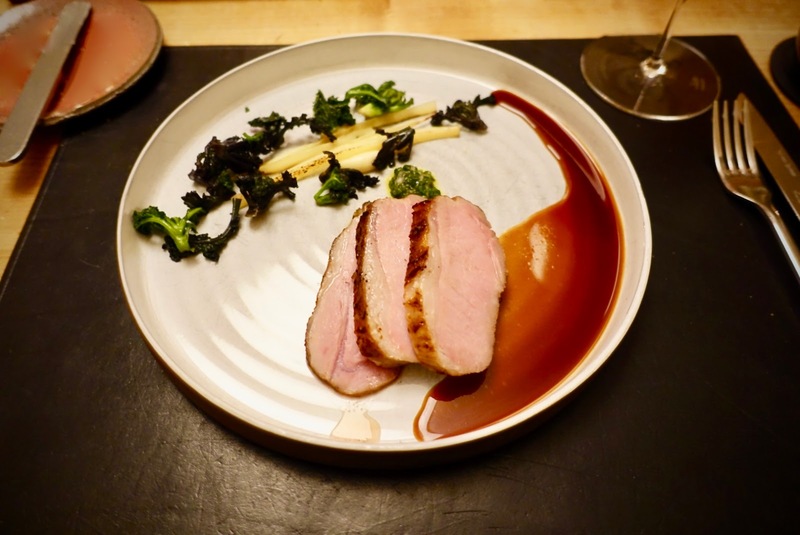 The main course featured Mangalica pig, prized for its high fat marbled meat, sometimes even called Kobe beef of pork. From what I understood, it was seared first, then braised and finally cooked sous-vide for 24 hours. 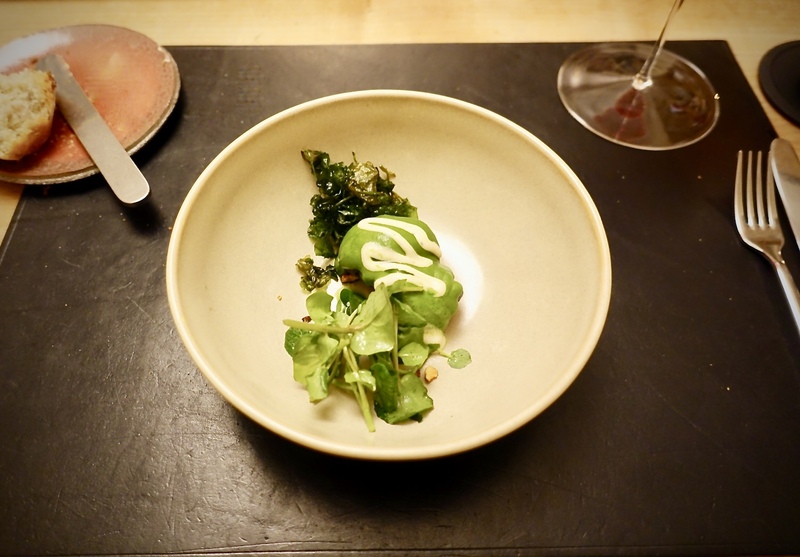 Miso was also part of the dish together with kale and black salsify, which complemented the rich meat just beautifully. 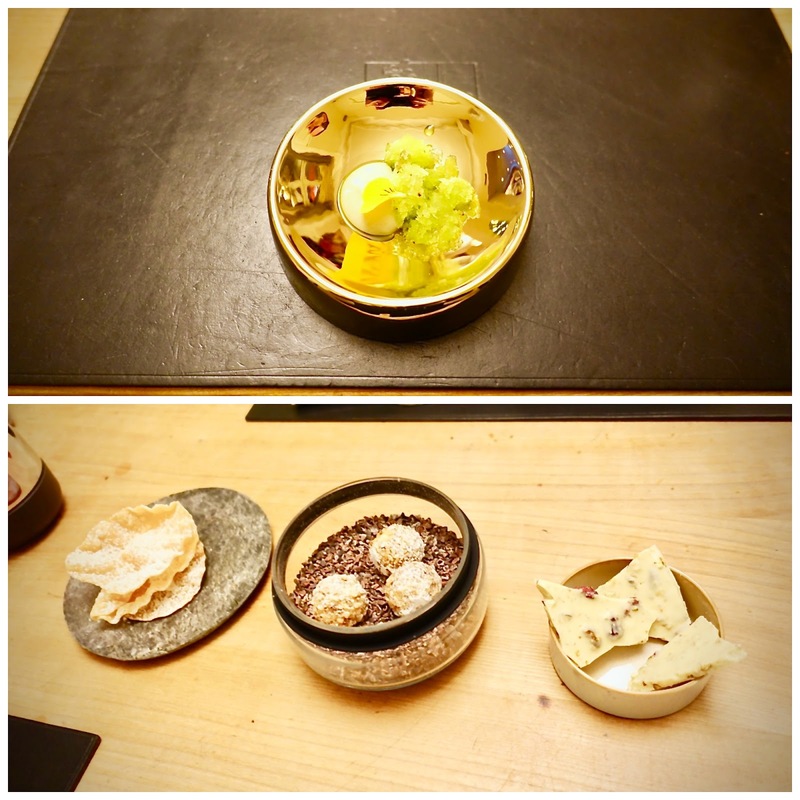 was framed by a pre-dessert (smoked milk with kiwi granite, flavored with lemon grass) and delicate petit fours (I adored the nut praline with a liquid core). A word to the serving sizes, they were sufficient considering that there was always enough bread to accompany your meal. The main course (pig) was even rather big, whereas I would have liked to see the main dessert a little more substantial in size. 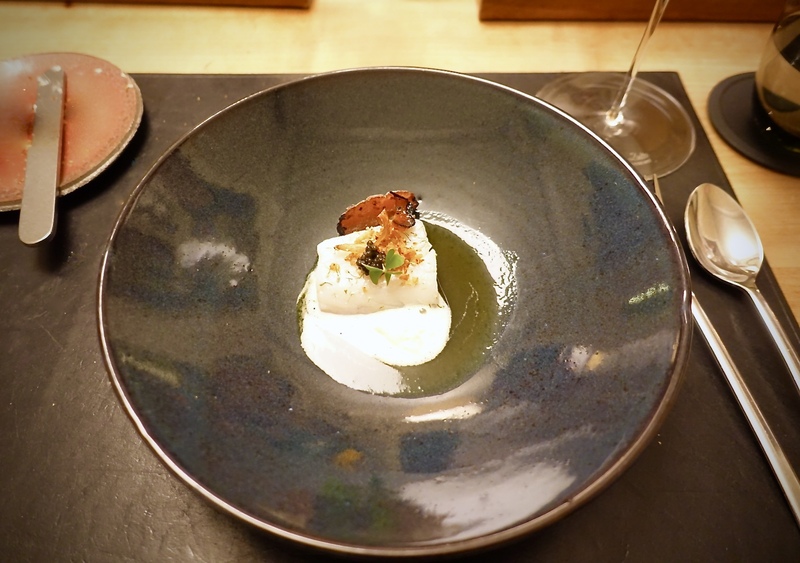 All in all, it was a delightfully balanced series of intricately composed dishes that surprised at every bite, highly recommended! The experience was enhanced by a perfect, high-class wine pairing, every now and then served in glasses that were real beauties. Together with the unpretentious location, the relaxed ambiance and the pleasant staff EquiTable made a remarkable high-end eating out.